The story is moving ahead at a snail’s pace at this point and the writer used eavesdropping generously in this episode to take the story forward. Having said that I must also add that this is one of those very few dramas which can easily be passed as a family drama. Although it deals with the usual shadi shuda zindagi ke masail and have a very bechari aurat as a lead but the director and the writer did not cross any lines which would make this drama into one of those which make you cringe every step of the way. Elma and Ramish were emotionally involved with each other at one time but even then when they met in this episode or earlier it was clear that both of these people shared nothing more than utmost respect for each other now. Also, Ramish kept on asserting the fact that Elma’s father wanted him to look out for them therefore this was something he was doing to keep a promise he made to a dying man. Zarbab’s affair with Javeria has also been given just as much screen time as was necessary. Unlike many other dramas, the negative character isn’t shown plotting and planning all the time which is also a plus. Neha’s conversation with Ramish and later on everything she said to Zarbab was completely in line with her character. There were however a lot of dialogues and situations which were highly repetitive. This has been the biggest negative point of this drama – the characters, dialogues and scenarios which haven’t changed at all in all these episodes. Zarbab’s sister’s marriage could have been a turning point but she is happily married. Also, Elma’s father’s death and the way her in laws acted in the situation could have been one of those situation which serve as a wake up call but Elma’s character shows no signs of changing. Zarbab’s character is the only one which has changed from bad to worse otherwise all the characters are pretty much the same since the beginning. Lack of character development in my opinion has to be the biggest flaw in this drama, other than that it is still a play which keeps on giving you something to look forward to. Arif’s track is getting interesting. His character is negative but it holds your interest. He told Rania, he didn’t want anything to do with his family and at the same time he told his mother that she can come stay with them after a while. He is a very clever person who does not believe in burning his ships. Neha explained Zarbab’s family in a very apt manner; they are insensitive and selfish. The confrontation between Zarbab and Elma however was not very gratifying. When Zarbab told her she was getting everything a gherulu aurat needed she should have told him she wasn’t get any affection – something which a person, any person needs more than anything else. Unfortunately, Elma is no match for Zarbab or his family and what is even more unfortunate is that even with the present circumstances she feels a sense of belonging towards these people. It is also strange that she chose to ignore the fact that her husband is cheating on her. Sharafat begum’s rants are getting monotonous. It has been very well established by now that she is very insecure and self-centered therefore showing scenes which reinforce this side of her personality are unnecessary. It is always a pleasure watching Hina Bayat on screen but I do feel that she is being wasted in this role. Tum Kon Piya has been directed really well and it has been written well too but the dialogues and scenarios were quiet average in tonight’s episode. All the actors have done complete justice to their characters. It is one of those very few dramas in which every actor has given immaculate performance but the characters are mostly black and white which makes this drama a decent watch but nothing outstanding which gives you something to reflect upon. We do need such dramas because the viewers need something logical yet not very heavy duty to watch during weekdays. 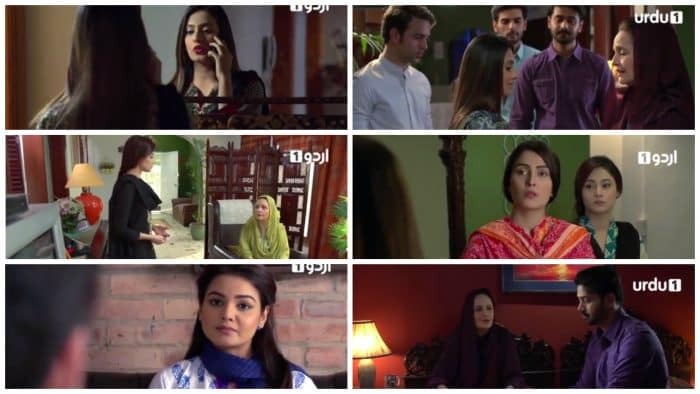 The preview of the next episode showed Arif accusing Elma and Ramish, something which was expected from him.